In the very maelstrom of world war, the British nation paused every night at 9:00 for what they called the "Big Ben Minute"—one silent minute of concerted prayer ... and it worked. Morally and spiritually, America is facing its darkest hour. Let us reach into the arsenal of history and bring out what one high Nazi official referred to as the Brits' "powerful secret weapon." Read the fascinating history of the Big Ben Minute below. Then join the growing throng of "Minute-Men" across America in one minute of daily concerted prayer. No gimmicks. No cost. Click on How It Works to get started. For those seeking further involvement, this site offers information about national prayer ministries, prayer conference calls, avenues to get the word out, and some excellent books on connecting with God. But all those things are secondary. What matters most is that minute per day when we all lend a hand, and together we move the mountain. Wellesley, startled out of his own dark musings, studied the barely discernible bedroll that was the source of his fellow officer’s voice. But, it was a different voice—uncanny, strained. A full minute of silence ensued, punctuated only by the companions’ raspy breath against the brittle chill. They sat in a meager lean-to perched in the Palestine hills. It was 1917, the 8th of December. Tomorrow’s battle would be the long-awaited and tediously planned “final move” to wrest Jerusalem from the Turks. So much had gone amiss in this Great War, but portents were favorable—at least to the hopeful—for a decisive victory at sunrise. If you can call it a sunrise, in this icy, rain-drenched winter! Wellesley caught himself shivering. This won’t do, now! Following the Great War, Pole immersed himself in the new wave of Eastern mysticism, becoming a key proponent of the emerging Bahá'í religion. But, God has a puzzling way of using even imperfect vessels in the fulfillment of His perfect plans. You will still have time. Lend us a moment of it each day. Although Pole never forgot his friend’s enigmatic final speech, its meaning remained shrouded—that is, until a second, and much greater, conflict threatened to wipe Britain, as he knew it, off the map. In April, 1940, Pole launched into action, campaigning for what he billed as “a rallying point in time, for a few moments every twenty-four hours, for thought, prayer, and personal renewal of courage, resolution, and faith.” His personal theses on the spiritual value of this “silent minute” sound a lot like something from Obiwan Kenobi—a nebulous synergy of psychic thrust with the vast, sympathetic legions beyond the grave. God was in the mix somewhere, as a great Force of Light and Good Will. But, in spite of his colorful theology (which he wisely—and diplomatically—kept on the Q.T. ), no man could have campaigned as relentlessly and passionately for this “National Minute of Silence” as did W. Tudor Pole. It seemed a hopeless task at first. Few could see the virtue of a daily “minute of interruption” in the lives of a nation that struggled hour by hour against impending calamity and fear. Then came the miraculous evacuation of Dunkirk. Hitler’s forces stood virtually immobile, like the prophet Daniel’s lions, for nine full days while hundreds of small, unarmed fishing boats and pleasure craft, manned by their civilian owners and crews, helped evacuate the British and French armed forces to safety. This “miracle of deliverance”, as Prime Minister Churchill labeled it, came in direct response to the May 26th National Day of Prayer declared by his majesty King George VI. Suddenly, the “old major, lobbying for his ‘minute-a-day’” didn’t seem so foolish after all. Members of Parliament warmed to Pole’s idea, and eventually Churchill, and even King George himself, threw their support behind the plan: a daily minute when all of Britain should put human activity on hold and bend their thoughts to Heaven. The proposed time for this daily tryst would be a natural focal point in their war-torn nation: the BBC’s nine o’clock news broadcast. So it was that, the night of November 10, 1940, Pole’s dream was realized, as the recorded voice of Big Ben chimed nine commanding peals—a full minute—across the airwaves, preceding the evening news. But, the Third Reich of evil fell at last, and Big Ben’s nightly broadcast minute became a Sunday-night-only feature in 1947. By the ’60s, it was dropped from programming forever and, eventually, all but forgotten—a nostalgic memory of silver-headed nannies. During his eight bloody empire-building years, Adolph Hitler invaded—depending how you count them—some 20 to 25 sovereign countries. But, in the face of relentless, punishing attacks from the Nazi Luftwaffe, culminating in a shower of over 1400 V-2 rockets (roughly as big around as an SUV, and as long as a school bus), over a 200-day period, which killed and maimed thousands of civilians, Britain not only remained unconquered, but joined the waves of offensive that rolled back the dark blanket of terror from the face of Europe. For those who have gone before us, time is up indeed. But we who still have time can seize the baton—of precedent and of legacy—proffered by that great cloud of witnesses, to fulfill God’s purpose in our own generation. Indeed, a grassroots movement is already afoot, in our own United States of America, to establish a daily Silent Minute for reconnecting with the Almighty. And, we have never been in such desperate need of it. There is no Luftwaffe blackening the skies over our cities, no U-boats closing in on our coasts. But more insidious—because they go unseen—are the very hosts of hell that threaten to destroy us from within: atheistic humanism, pervasive substance abuse, rampant immorality, the holocaust of abortion, the god of entertainment ... and the list goes on. Judgment hangs over America like Damocles’ sword—suspended by a single hair of God’s patience. Our plight seems so hopeless that we assume it would take an army of Elijah clones, all dressed in potato sacks, fasting and praying for forty days, to begin to make a difference. Not so! Consider that, just as a minute of united, concurrent prayer disarmed the satanic engine of the Third Reich, such a phenomenon could open the windows of Heaven to slake the moral and spiritual drought of our time. My wife and I were at a roadside rest area last winter, when we noticed a man acting very strangely. First, he spread a blanket on the tarmac behind his parked car. Standing on the blanket, and shading his eyes with one hand, he turned this way and that, studying the sky like E.T. waiting for the Mother Ship to arrive. Then he knelt, forehead to the ground—facing precisely east. I have no doubt that we were witnessing a Muslim worshipper facing Mecca to say his prayers at the prescribed daily hour. But to us, this was a foreign scene indeed. Jesus told the woman at the well, “You Samaritans worship what you do not know; we worship what we do know....” As disciples of the living Christ, we can stand to learn something of the discipline of Islam. If they can synchronize their prayer times in united appeal to one who does not hear, then why can’t we approach our loving, attentive God in unison of time and purpose from coast to coast? And, what effect might this collective onslaught have on the gates of hell? Don’t think it would be feeble—but, staggering indeed! Such was the deafening, united shout that brought down the walls of Jericho. Why not join a growing corps of “Minute-men” across our land who, like the Minutemen of the American Revolution, are committed to decisive action: one minute of daily, consistent, concerted prayer to change the course of history in our nation? In fact, most cell phones and pagers come equipped with an alarm feature. Set it for 9:00 p.m. Eastern Time (8:00 Central; 7:00 Mountain; 6:00 Pacific). Then—facing, not Mecca, but the very throne of God in heaven—join with thousands across America in a one-minute prayer of agreement. The sword of God’s judgment remains suspended by an unbroken hair, partly because of the righteous few. We still have time. Let us lend a minute of it each day, until the rain of God’s grace saturates our dry, thirsty land once again. Ready to make a difference? Click on How It Works to get started. This article, which appears above in its original form, was first published in the November 23, 2008 issue of King's Courier, a bimonthly magazine. It has since been modified (to suit available space) and reprinted by a number of publications. Lang, Walter. Introduction. Writing on the Ground. By Wellesley Tudor Pole. London: Neville Spearman, 1968. 9-18. Dakers, Andrew. 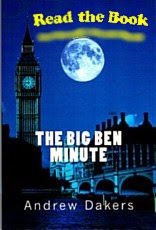 The Big Ben Minute. London: Dakers, Ltd.; Edinburgh: Riverside, [1943?]. 7. Santayana, George. Reason in Common Sense. 1905. New York: Dover, 1980. 269-291; ch. 12. "One minute of prayer each night-Grass Roots Effort." TruthOrFiction.com 2008. 23 Nov 2008 . The Holy Bible, New International Version (NIV). 1973. Grand Rapids: Zondervan; Colorado Springs: International Bible Society, 1988. Ezekiel 22.30. All content Copyright © 2011-2013 Saddle Mountain Communications, Elkton, MD, U.S.A.